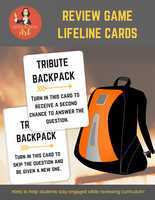 Review Game Lifeline Cards (Hunger Games-style) - Works with any subject! Clipart of American political leaders - President Donald Trump, Secretary of State Hillary Clinton, and President Barack Obama. Use on worksheets, Smartboard files, assignment sheets, bulletin boards, classroom decorations, DBQs, flash cards, etc. Six classroom posters featuring inspirational quotes from 2016 American political leaders. Features two quotes from each: President Donald Trump, Presidential Candidate Hillary Clinton, and President Barack Obama. Print and post around your room. Ask Honor Roll Art a question. They will receive an automated email and will return to answer you as soon as possible. Please Login to ask your question. Built for middle school and high school, I have been teaching ELA at the middle and high school levels for 10 years. I left the classroom to work as a curriculum writer and teacher trainer for several edtech companies. With small children of my own, I was drawn to the clipart available on TpT geared towards elementary students. However, I noticed a gap in what was offered for the higher level students. With a sophisticated style, I hope my products will help to engage your older learners! Student-centered through and through. My students and I have a rapport built on the fact that I treat them like humans with lives outside of my classroom. When should an assignment be due? THEY tell me. What score does their work deserve? THEY tell me. Kids are desperate to be asked their opinions and to be shown why what we're learning matters. No busy work. Tons of applied learning! Ultimate professional goal: To give a TED Talk on why we need more attention and resources offered to our gifted and talented students. A rising tide lifts all boats!